Boxing Day, St Stephen’s Day, 26th December…whatever you call it, it’s the day after Christmas and it happens to be my birthday. This year I spent the day at my brother’s (as I did on Christmas Day) and again I was looking for an outfit that was versatile enough to be comfortable and stylish. I opted for the George at Asda Jacquard Skater Dress (£14, UK sizes 8-24 (now sold out)). I’d bought this dress back in November after spotting it in store and falling in love with the jacquard print and the heavenly colour (teal is my favourite! ), despite the fact that I’m not really a fan of skater dresses on me. I went for a size 16 but ended up returning it and exchanging for a 14 as it was a better fit overall. The colour is so, so, so lovely! My pictures here make it look more of a bluey-teal (it’s described as ‘petrol’ on the George at Asda website) but in fact the stock photo is a pretty accurate representation of the actual hue, as are my photos later in this post. The dress is made up of 74% polyester, 19% viscose and 7% elastane. It’s machine washable and super easy to care for. The fabric feels silky soft and is delightfully stretchy so it fits nicely in the upper body whilst also having enough weight and flexibility for the skirt to hang well. There is a slight sheen to the material and that helps to make it sparkle as the dress moves. Lengthwise I would have preferred for the skirt to be longer. The size 16 did come up a bit longer on me but it was still very much above the knee. I know skater dresses are designed to be like this but I just don’t feel that it’s the best look for me. I can forgive this dress for its shortness, though, as I adore everything else about it! The fairly high and rounded neckline is good for times when showing cleavage would not be appropriate. The dress doesn’t need to be low cut as the upper body is fitted so my body shape is still apparent without it being too much. The bust room on this dress is brilliant. For reference, I am wearing my Ewa Michalak S Szykuś 32KK/70KK bra in these photos, and the rounded, uplifted shape I get from this bra works wonderfully with skater dresses where no cleavage is on show. I haven’t yet worn this dress with a belt as I don’t think it needs it, and of course it’s nice to have some dresses where I don’t feel that I have to wear a belt. However, I did add a shrug when I wore the dress on Boxing Day as I wanted to have my arms covered. My Pink Clove Velvet Shrug in black works very well indeed with this dress and the velvet adds a touch of glamour. On previous everyday occasions I have teamed the dress with a cotton shrug from Excite Clothing and my trusty Maidenform leggings but for Boxing Day I was after a more festive and smart look so thick black tights and a velvet bolero were the order of the day, and I’m pleased to report that I got several compliments on my outfit. And, more importantly, I was very comfortable all day! What items of clothing do you go for when you want to look smart but feel comfy? A black dress and tights is a classic option! But it's nice to mix it up sometimes by adding in some colour – how about purple tights, for instance? I have this dress and I love it to bits! I am a big girl and have always been very impressed with Asda's plus size clothing options. There is more online than in store but it's still really good. And the clothes are fab, not like Tesco's dowdy range!!!!!!! Awww thanks Kristin 🙂 I didn't make any wishes but I did get the most wonderful home-made card from my 7 year old niece. It made me cry (in a good way)! you look fab! 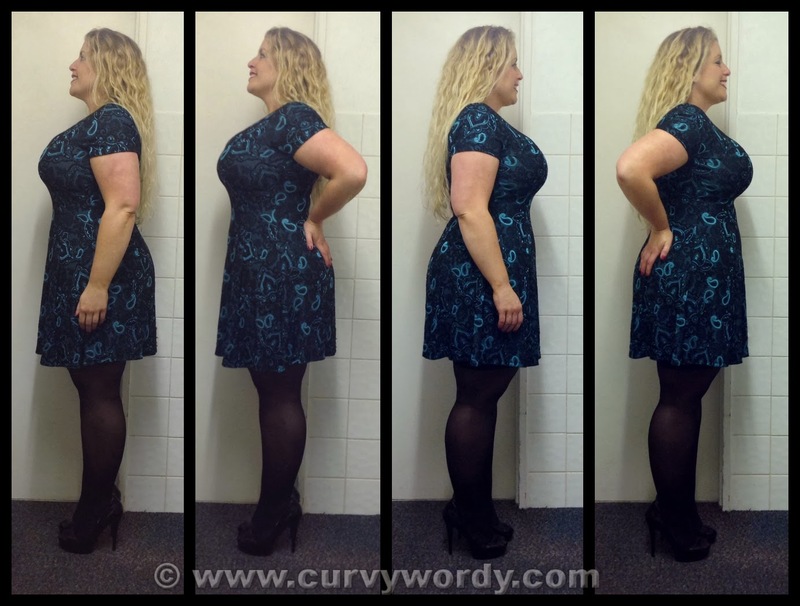 i luv Asda clothes as they do do some plus sizes – and your blog helped me find a few gems!